Harrisburg PA business travelers. Is your destination Central Pennsylvania or Harrisburg Pennsylvania area for business? Make it your New Year's Resolution to stay someplace different, somewhere with a "home away from home" atmosphere. Try The Bridgeview Bed & Breakfast!! At the Bridgeview B&B our rates are competitive with corporate rates. The difference being, you can "kick back" and relax in a comfortable setting, be it our sitting room, multiple decks, front porch or living room. We have clean comfortable rooms, with private baths, individual A/C, high speed internet with hard wire connections in each room, WiFi throughout the building and grounds and a continental breakfast to start your day off right!! Call 717-957-2438 or visit http://www.bridgeviewbnb.com for rates and room info. 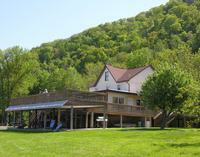 Make The Bridgeview Bed & Breakfast your business lodging destination for Mid-state Pennsylvania!! A Central location to York, Harrisburg, Hershey, Lancaster and more!!! Railroads have always been known by their heralds. The Baltimore & Ohio's legendary "Capitol Dome" herald represents the Railroad that served our nation's Capitol and evokes names like the Capitol Limited, a fine Passenger train still operated today by Amtrak. In 1973 the C&O and B&O united to form Chessie system, creating a new logo and ending usage of the time-honored B&O classic. In 1987, the B&O, oldest American railroad at the ripe old age of 160 years, merged into CSX Transportation, and ceased to exist. Today, the emergence of heritage units has revived many of these vintage heralds. Yet somehow, a few of the original logos survive, soldiering on in daily mainline service. 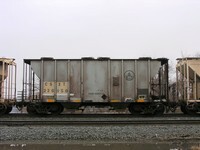 Seen here entering Enola yard in December 2012, is a real heritage B&O hopper, "patched" for CSX, but retaining most of its original B&0 lettering. Still looking great after almost 40 years! Just amazing!! Even more so considering there's no graffiti!!! The Bridgeview B&B is a great spot to see new & old heritage trains and just trains in general!! See for yourself, give us a call at 717-957-2438. Make The Bridgeview Bed & Breakfast http://www.bridgeviewbnb.com your Central Pennsylvania and Harrisburg area railfan lodging destination!! 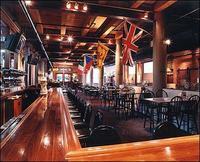 The original Appalachian Brewing Company brewpub is located in historic Harrisburg, PA. The impressive three-story brick and heavy timber structure was built circa 1915. The laagering room portion of the brewery dates to 1890. Throughout the brewery, antique brick walls, massive wooden beams, hardwood floors and ceilings provide a warmth and inner glow rivaled only by the beer itself. Proud to be the first and only brewery in the Pennsylvania State Capital since 1951, ABC serves fresh innovative cuisine to match their tremendous handcrafted ales and lagers! The month of January 2013 is jam packed with upcoming shows at ABC, you'll love! The Bridgeview Bed and Breakfast is conveniently located across the Susquehanna River, about 15 minutes from Appalachian Brewing Company. Make sure to book your stay at Perry County's best kept secret. The Bridgeview B&B is nestled amongst the famous stone arch Rockville Bridge crossing the Susquehanna River and the beautiful Blue Mountains. Combined together, the scenic view will entrance you as you gaze out of the oversized windows in our Observation Room. Call 717-957-2438 to reserve a room or visit http://www.bridgeviewbnb.com to take a virtual tour. See for yourself why our guests keep returning to the Harrisburg area of central Pennsylvania, and be sure to check our guest reviews!! Five tremendous brass musicians - each a virtuoso in his own right - form the legendary Canadian Brass. With an international reputation as one of the most popular brass ensembles today, the Canadian Brass has truly earned the distinction as "the world's most famous brass group." We especially extend a warm welcome back to the group's newest member, Eric Reed, who left his former position with the HSO Horn Section to join the CB in 2011. Explore the beauty of the Bridgeview Bed and Breakfast. Let us accommodate you while you settle back and observe the graceful water fowl effortlessly glide along the gently rolling waters of the Susquehanna River while you bask in the magnificence of the mountainous back drop. Live locomotives lazily journey past allowing you those visionary photo ops. We are located about 20 minutes from the Harrisburg Forum where the show will be held. To book your room and experience the beautiful view call 717-957-2438 or click today. Also, check out our reviews at Trip Advisor and see why our guests make The Bridgeview Bed & Breakfast their lodging destination for the Harrisburg PA area of Central Pennsylvania!! Copyright © 2010-15 ---. All Rights Reserved.